All about what’s going on with WebRankStats.com and our subsidiaries. New Features: GZip Compression check as well as Text2HTML ratio in your website statistics. GZip compression when enabled makes your website to download faster as the browser does the work of de-compressing it and therefore you save on bandwidth as well as make surfing on your website faster. Text2HTML ratio of your website should be in the vicinity of 12% and above in favor of text on your website. Using the above stats you can make your website download faster as well as know if you have a bloated layout which minimizes the relevance of your content. We are soon going to launch PDF reports, sign-up for an early bird 40% discount. We are planning to launch PDF reports for our users to provide detailed analysis for your websites. In the comprehensive report we will include detailed analysis as well as ways to improve your SEO score. 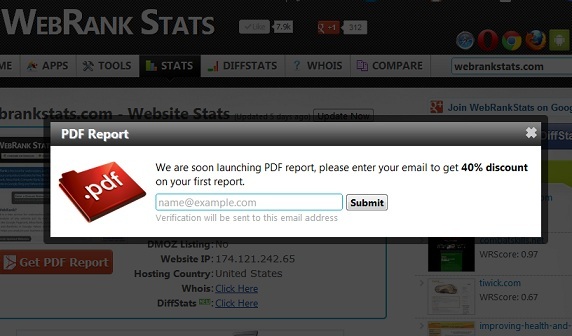 Just open the stats on your website and you can click on the “Get PDF Report” button to enroll yourself for a 40% discount on your first report. You don’t have to pay for anything till you get your first report. If we get a huge response we will slash the rates for upcoming reports as well.